We are so excited to introduce our new baby! That should really read our new BABY CALMER shouldn’t it?! The NO 1 Manufacturer of White Noise Machines, Marpac, have done it again! For over 54 years, they have been bringing some serious sleep to millions of people throughout the globe. 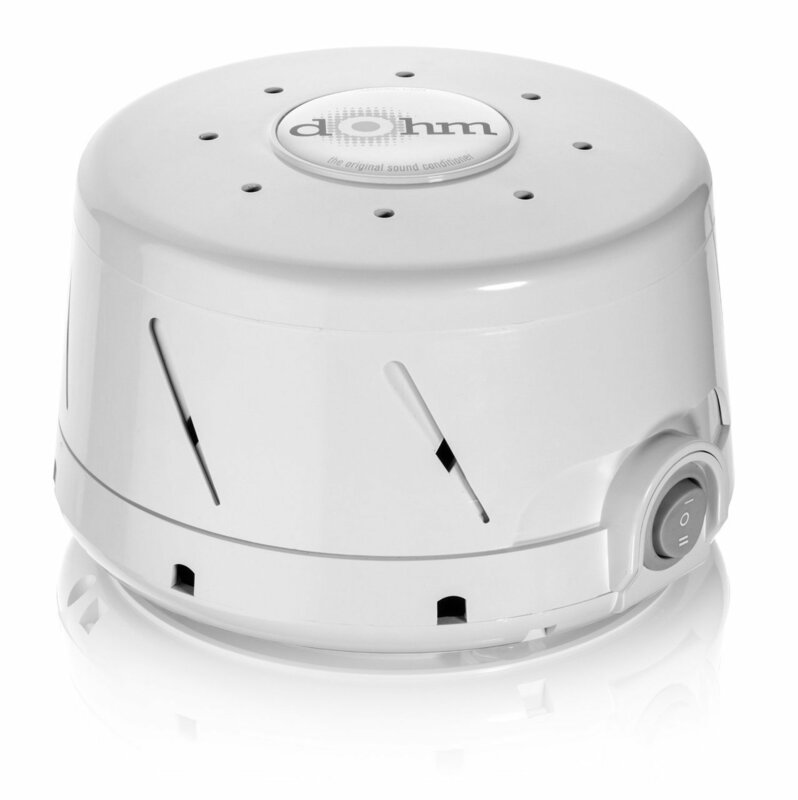 The DOHM Ds Sound Machine has been our BEST seller for years! 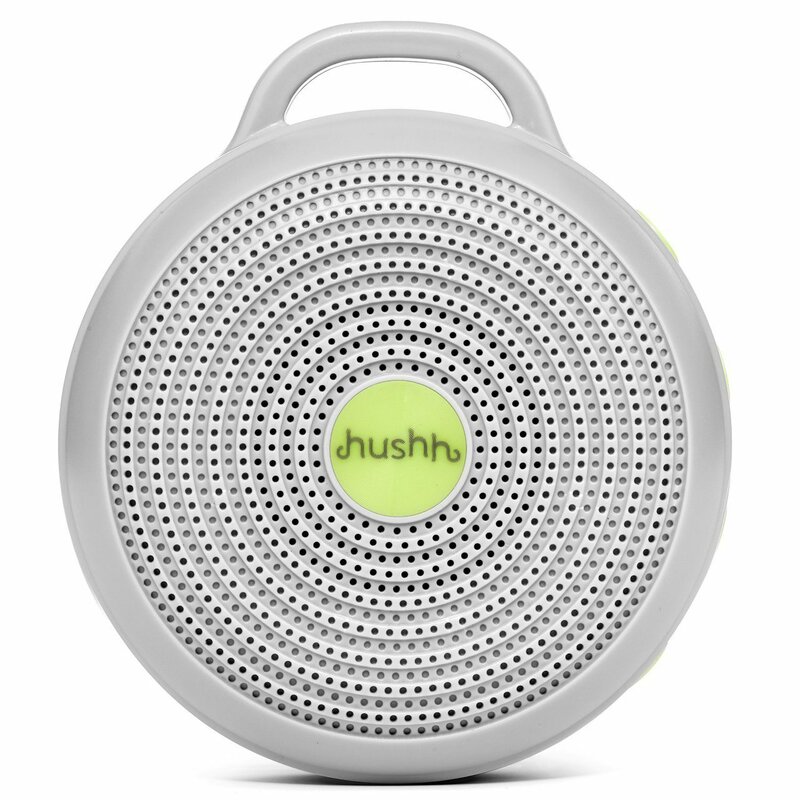 It is about to get pipped at the post for the very first time by it’s little baby brother, the HUSH White Noise Machine. 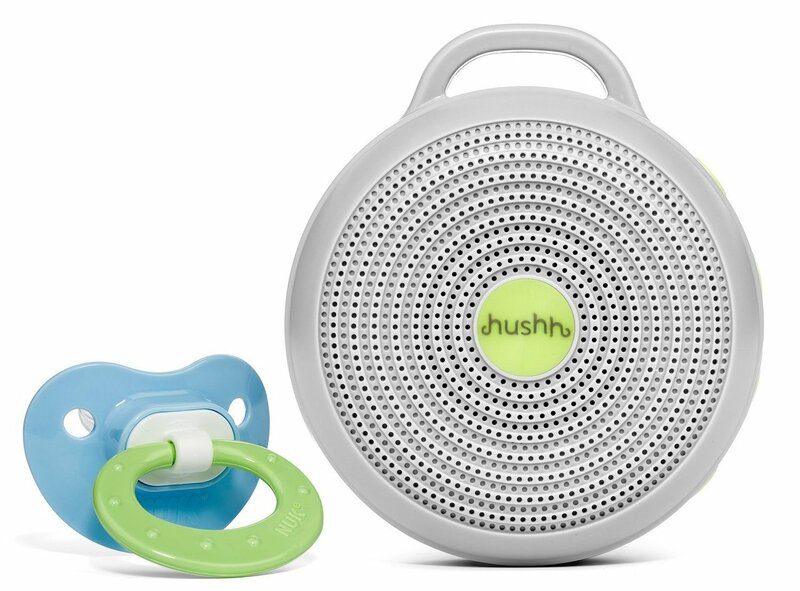 Hushh, a portable sound machine designed to help baby or you fall asleep and stay asleep anywhere! For baby, pop it on your stroller while you’re doing the shopping. Attach it to your little ones car seat – especially wonderful if you’ve got older brothers or sisters who want to chat, sing, cry, laugh and wake bub up! For adults, simply place it anywhere you want in your room! On your bedside table, dresser, bedhead etc. It is a dream machine! The Hushh creates a consistent, soothing, comforting sound, that makes for the perfect environment to keep your baby peacefully asleep. 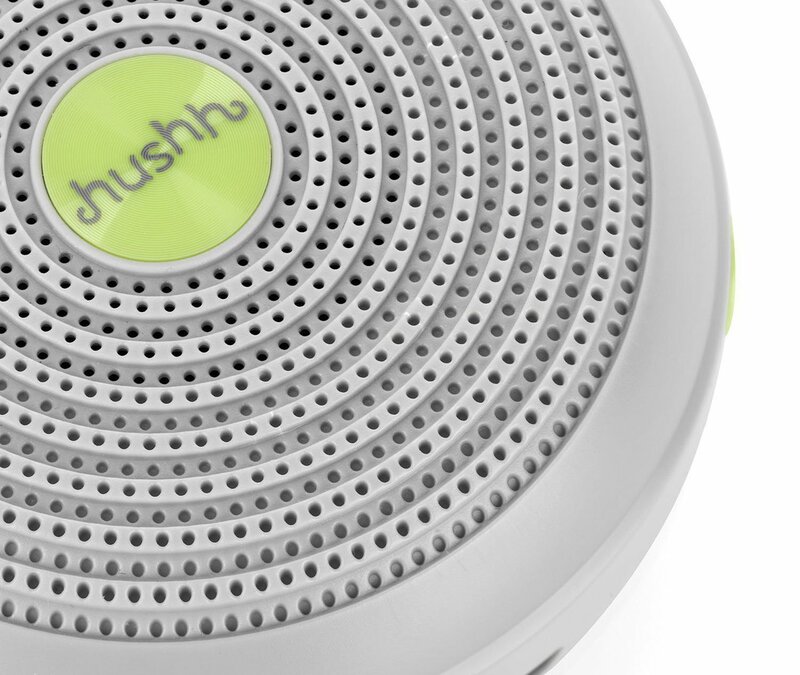 The new Hushh has 3 sound options for you to choose from: deep white noise, bright white noise and gentle surf and has a wide volume range. Perfect to soothe baby the whole night through and wonderful for naps when out and about. Hushh is powered by a lithium ion battery and recharges from a micro-usb cord (included). It ideal for masking disruptive noises and it promotes longer, more restful sleep cycles. Fantastic amber night light, creates a soft warm mood in the room and is great for checking on bubs without disturbing them with bright white lights. Perfect for toddlers who are afraid to sleep in the dark too! MASKS NOISE – No need to worry about anyone (or anything) waking baby, even when you’re out & about! 12 MONTH WARRANTY – Backed by a one-year limited factory warranty and the always exceptional Marpac customer service promise. Can this unit run on mains power? The Hushh White Noise Machine was manufactured & released by Marpac only this year following many requests from customers for a portable White Noise Sound Machine. People had been requesting a portable unit, that could easily be used while on the go & be hooked onto bubs pram or whilst travelling in the car etc. A lot of customers use it permanently in their child’s (& their own) room. White Noise has many benefits for people needing sleep – not just bubs. The Hushh can run while plugged in (mains powered). When plugged in there is a charging indicator light that lets you know it is on charge mode, the little light blinks when this is happening. This light is not to be confused with the night light. The night light is a brighter light that you can choose to have on or off in your child’s room. The unit is volume adjustable & it intended to be placed somewhere in the babies room, not in the cot. We personally used to sit our white noise machine in the corner of our child’s room on a set of drawers. The Hushh was unfortunately not available when our children were babies. We used & loved the Dohm White Noise Machine. When the Hushh unit is running on the charger, the little charging indicator light will flash. This hasn’t been a problem with customers to date. You could place something in front of the unit to block the light it you felt it was a problem. What is the Battery Life of the Hushh? 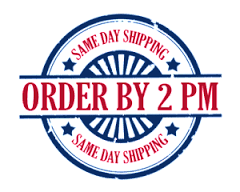 As for the battery life, it varies depending on the settings you choose to use. At optimum power – this is at the highest volume, which is the deepest sound with the night light on, the unit will last about 4–5 hrs. At the opposite end of the spectrum— on low volume, less taxing sound selection, no night-light, it will last over 20 hours. This is a very nice product. Very compact and packs a wallop of sound. Turning it on is fairly easy … you press the power button for about three seconds. A light goes on to tell you it’s on. You can choose from three sound and can control the volume as well. Since this normally may hang from a stroller, one needs to be careful about the level of sound not to injure an infant’s ears by having it too close. The product comes with a nice circular ring that goes on easily and can hang from a stroller. While this is geared for an infant, I think I will find plenty of uses for it, especially with all those evening lawn mowers that plague the airwaves at times. Nice product, easy and compact. You can’t go wrong. I’ve tried other white noise machines and they were all uglier, bulkier, or didn’t sound as good. Some had up to 15 sounds, none of which were effective or were actually distracting (Thunder storms ? Jungle noises?) This one is small, portable, and the sounds are simple but effective, without any noticeable looping repetition. The controls are simple. This adult appreciates the just bright enough but not distracting amber nightlight. The only thing I don’t like is that charging is by USB only. Th e controls are simple. This adult appreciates the just bright enough but not distracting amber nightlight. 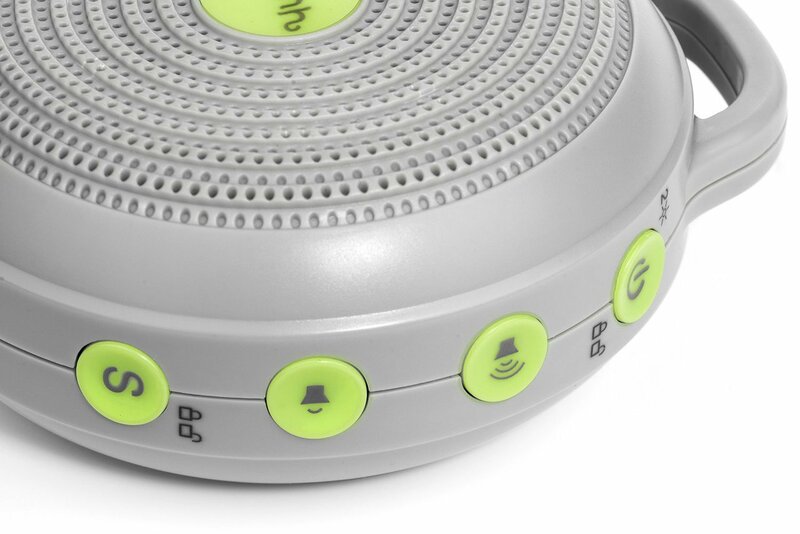 As a fan of the Dohm, i was, i admit, skeptical about this little sibling. The magic of the dohm is that, unlike standard white noise machines, it’s analog. There’s not subtle gap when the digital file repeats, no annoying patterns that you can detect after the 100th cycle and are driven mad by after the 200th. This little gizmo manages to avoid those pitfalls while also offering features the Dohm can’t. For example, it’s much, much smaller. It has a much wider volume range. It has a night light. It can do different types of white noise (though i wish it could do pink noise, i find that so much more soothing). It can do an ocean impersonation, too, though to me the range of sound within that setting was too wide. 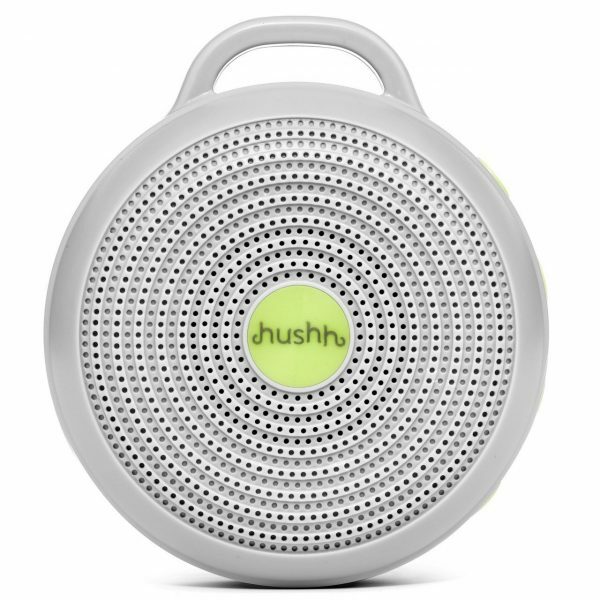 So, basically, this is a great little white noise machine, and it’s perfectly useful for people of any age. It’s not explicitly baby-y, you won’t feel silly hauling this around like you might if you had one of those sleep-sheep things. It’s not as snuggly as the sleep-sheep though, i’ll grant that. Great White Noise Maker. Portable & Attaches Easily to Stroller, Car Seat or whatever! 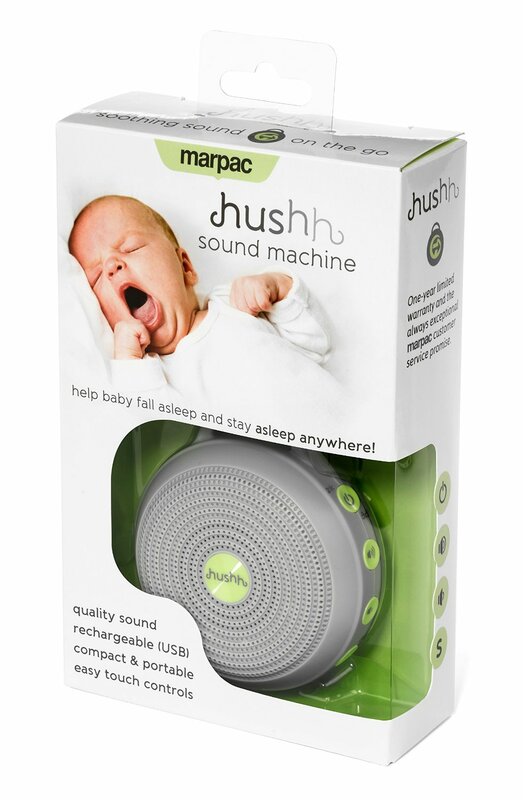 This Marpac Hush Portable Sound Conditioner works very well for any age human. I especially like this for travel so I can sleep well without being wakened by strange noises. It comes with a usb cable for charging. There are three sounds to choose from: bright white noise, deep white noise, or gentle surf. This unit is extra special white noise unit because there is a baby-safe clip to attach it to a stroller or car seat so that your baby does not waken from startling noises. This is a winner! I have nothing negative to say about it and recommend it to friends and family. It never occurred to me to attach a white noise maker to a stroller or car seat and I think whoever thought of that is a genius! Is white noise harmful to babies ears? The unit is recommended to work best across the room (at least 1 metre) away from the sleeper. Like any noise, it is not suggested or recommended to have directly near a child’s ears. The machine is capable of producing a fairly high level of decibels, of course which is volume adjustable. We recommend keeping it at around half-volume for infants, which I’m sure that you’ll also find is more than enough to mask unwanted noise from bubs room. We encourage any parent who may have concerns about decibel exposures to also chat with their paediatrician or doctor to put their mind at ease. We are not medical experts, but we are parents who live in the real world. If you are a fan sleeper, you’ll most likely want the Dohm. 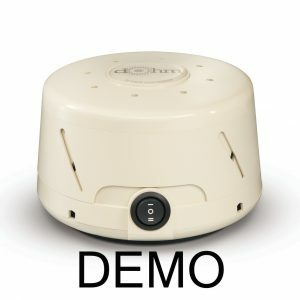 The Dohm is the original sound machine, first created (by us) in 1962.It features a real fan inside an adjustable acoustic housing, so you can alter the tone and volume of the sound to suit your personal preferences and needs based on your sound environment. This ability to customize the sound makes it superior to a regular fan for sound masking purposes, and it also uses less energy than a fan. Additionally, the Dohm is compact (easy to tuck out of sight or travel* with) and won’t create airflow, so it’s especially great in the wintertime or if dust and allergens are a concern. If you travel or have an especially loud situation to contend with, we recommend the Rohm/Hushh. The sound of the Rohm is a little less like the “whoosh” of a fan and more like a deep “static-ish” sound. Like the Dohm, there are no loops or digital recordings. Choose from constant white noise (bright or deep), or gentle surf. 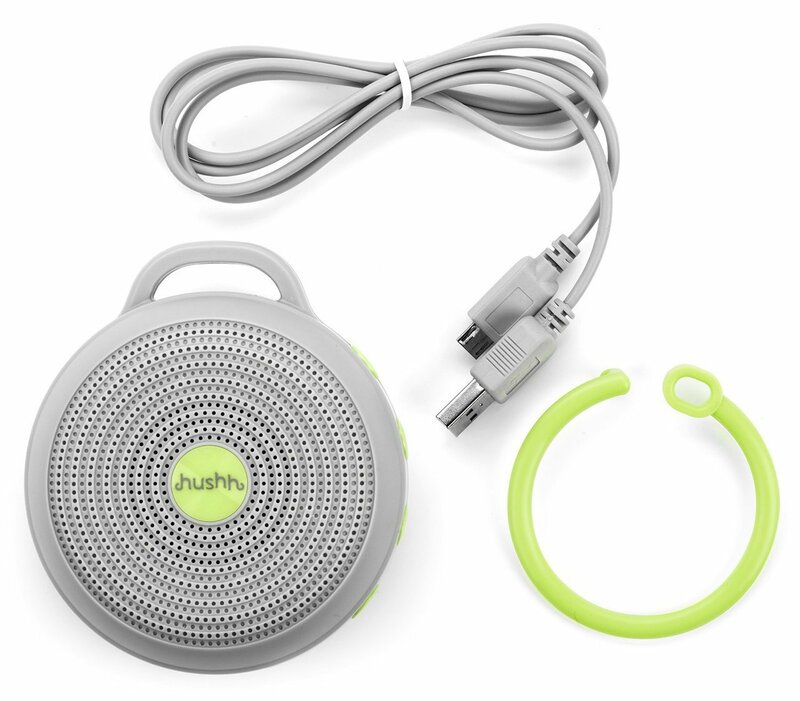 The Rohm/Hiushh is compact and a USB cable. Pro tip: in noisy hotels, try placing the sound machine between the door and your bed, then adjust the tone and volume to your liking. You’ll find that pretty soon, you don’t even notice the sound of the machine, but you ALSO don’t hear the doors banging or voices in the hallway… sound machine for the win. We, my husband & I, & our baby of course, LOVE our new machine! 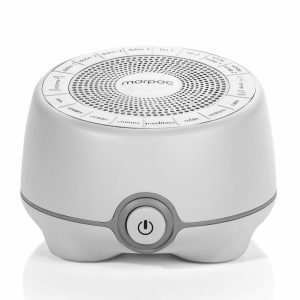 I have friends who have been raving about white noise machines for ever, which I never understood until I had my first baby & even more so until we eventually succumbed to the hype & bought one for ourselves. I never knew how much I would find myself raving about them too. It’s simple really, if you’re thinking about getting one, get it! You wont regret it. I’m really happy with this device. 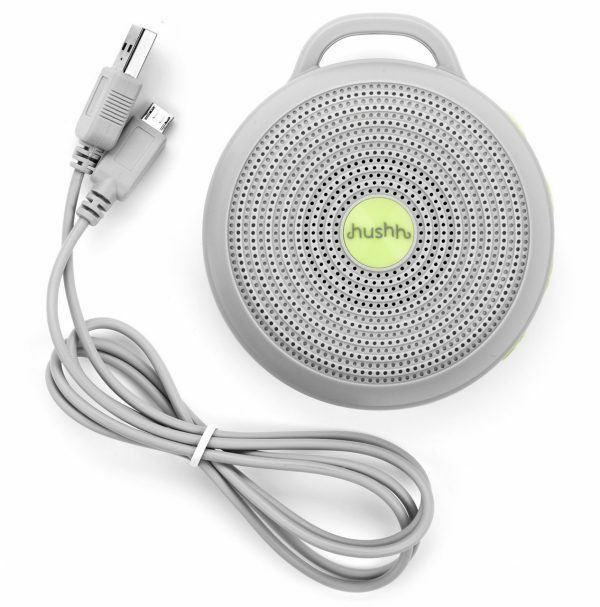 It can be charged via 240v using a phone charger USB connector and has a huge sound range. Compact and handy for our caravan, compared to the adult version purchased many years ago. My wife had read a lot online about white noise helping babies sleep. I kept saying no because I couldn’t see how they could work. After many sleepless nights and desperation, I agreed to try hush machine figuring it was worth a try. I am eternally grateful for my wifes constant pleading to get one because It’s bloomin brilliant! We’ve told all our friends and they’ve bought them too! I highly recommend these if you have a small child who wakes in the night or does not sleep long (when they should be) through the day.